All four Nigerian representatives in all the continental club competition zoom to the next round of the both CAF Champions League and the Confederation Cup respectively for the first time in recent participation. In spite of the fact that MFM FC and Plateau United already had one leg in the next round each before their respective return leg fixtures on Wednesday, their respective win secured them into the next round of the competition. Enyimba will face Benin Republic’s Energie FC in the first round of the CAF Confederation Cup after the modest side secured a shocking 2-1 aggregate win over Haifa of Guinea in the preliminary round. While Akwa United prove doubters wrong with a comfortable 2-o win over Hawk FC of Gambia. Raphael Ayagwa lifted 10-man NPFL champions to triumph with a lone goal away at Eding Sport of Cameroon on Wednesday, the goal was enough to give the Jos led side a 4-1 aggregate win in the wake of winning 3-0 in the first leg in Nigeria. 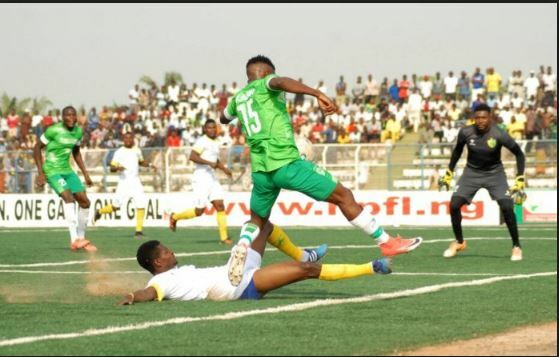 It wasn’t all rosy for Plateau United as they were reduced to 10 men following a red card awarded six minutes to the end of the pulsating encounter. They, however, clung to claim a noteworthy win which secures their entry to the next phase of the competition. It was another splendid day for the Olukoya Boys at the newly approved Agege Soccer Temple in Lagos where Chijioke Akuneto was on the scoresheet and became the first scorer of an international goal as the Fidelis Chukwu led side pipped Real Bamako of Mali to advance to the next phase of CAF Champions League. Akwa United made a shocking comeback in Gambia in the wake of toppling a one-goal shortfall to beat Hawks FC 2-0 in the second leg of their CAF Confederations Cup tie on Wednesday at the Independence Stadium. Hawks FC pulled a surprise plug on Akwa United in Uyo a week ago with a 2-1 win courtesy first-half goals from Muhammed Jallow and Lamin Charty while Victor Mbaoma got the home side late goal to set up a mouth-watering second leg to qualified on a 3-2 aggregate. Cyril Olisema scored a double for Abdu Maikaba’s men in the acutely challenging encounter. Olisema scored the opener in the 36th minute and got the decisive second goal ten seconds after the break. It is the first time the Promise keeper will make it to the first round of the competition in the wake of losing to Vita club Mokanda of Congo in their continental debut two years prior.